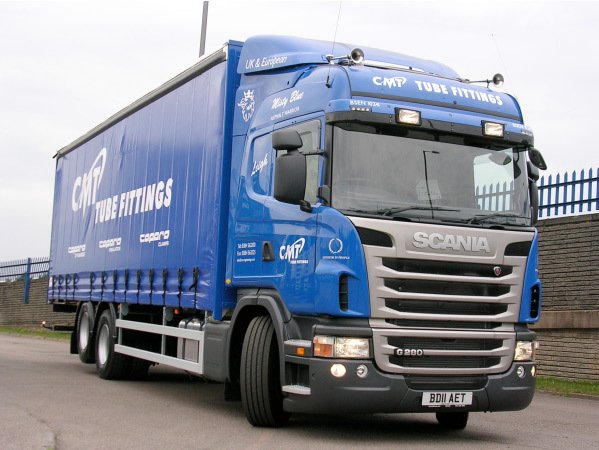 CMT Tube Fittings of Crongreaves Road, Cradley Heath, have chosen Keltruck Ltd to add a new Scania vehicle to their fleet. 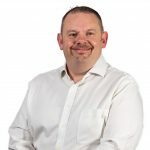 The deal was made between Gary Hughes, New Sales Account Manager of Keltruck and Gary Ruston-Shaw, Manufacturing and Distribution Manager of CMT Tube Fittings. The vehicle delivered is a Scania G285DB6X2MNA Highline and was purchased as a new replacement for a current vehicle within their fleet. 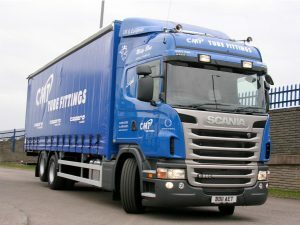 The vehicle will be used for multi-drop distribution and collection throughout the UK. The vehicles that feature Scania’s new two pedal Opticruise gearbox have been supplied with Keltruck’s 5 year full contract hire package and will be maintained at Keltruck’s West Bromwich vehicle maintenance unit. Gary continued, “Gary Hughes’s help and enthusiasm was never ending, always available, helpful and suggestive of modifications and improvements we could make particularly on the body builder, who I am pleased to say has done an excellent job. My driver is more than happy with his choice of vehicle and from a personal and company point, i am confident that the best value for the money available has been achieved, again all down to the help and enthusiasm for the sale by Gary Hughes”. The newly designed corporate livery designed and supplied by Spencer signs of Halesowen completes what is an overall impressive package. David Morgan, New & Used Sales Director, Keltruck Ltd commented, “I was pleased to welcome back CMT to Keltruck Ltd. I was pleased to hear that our relationship is as strong as ever and I will look forward to a healthy future working with the customer”. The original company of Tube Fittings was established in 1926, then at some time during the 1960’s it became part of a group known as Central Manufacturing Trading, (CMT), then in 1982 the whole group was purchased by the CAPARO group. CMT Engineering are predominantly manufacturers of Gas Water and Steam fittings so our main target market is that of merchants / suppliers but we have four companies on our site at Cradley Heath with such diverse activities as : Military shock and vibration systems, Heat and Electrical insulation products and Clamping solutions for the anodising industry.